Tamron announced yet another new-generation lens for both Nikon F and Canon EF mounts, the Tamron SP 24-70mm f/2.8 Di VC USD G2. The new professional-grade lens sports an impressive optical design, with a total of 17 elements in 12 groups, four of which are aspherical elements, two have extra refractive and three have low dispersion properties. Just like the recent “G2” series lenses from Tamron, the SP 24-70mm f/2.8 Di VC USD G2 comes with eBAND and BBAR coatings to reduce ghosting and flare, and fluorine coating has been applied to the front element to protect the lens against dust, dirt and smearing. Sporting an advanced image stabilization system, the lens is capable of reducing camera shake by up to 5 stops. Lastly, the lens is weather sealed and is compatible with optional TAP-in Console for fine-tuning the focusing properties of the lens and updating lens firmware. 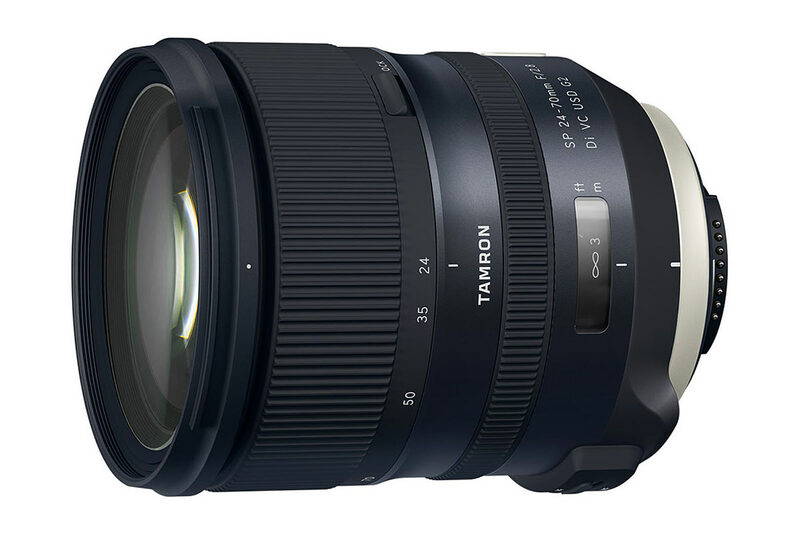 All this technology available at a very appealing price point of $1,199, making the Tamron SP 24-70mm f/2.8 Di VC USD G2 even cheaper than the recently introduced Sigma 24-70mm f/2.8 DG OS HSM Art. This is a very exciting release and I am looking forward to testing and reviewing the lens later this year, as soon as it becomes available. There is a noticeable curve towards the edges of the frame, indicating some field curvature at the longest end. I personally don’t see a problem with this, since field curvature can be drastically reduced when stopped down. And considering that this lens is mostly targeted towards landscape and architecture photographers, that should not be a problem. 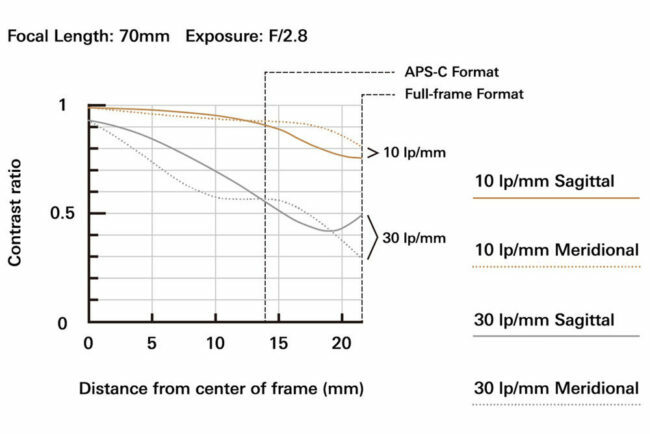 Looking at the MTF curves of the Sigma 24-70mm f/2.8 Art, the performance of the Tamron SP 24-70mm f/2.8 G2 looks a little more consistent, although both have their strengths and weaknesses. As for Nikon’s 24-70mm f/2.8E VR, it definitely looks inferior compared to both the Sigma and the Tamron 24-70mm f/2.8 lenses based purely on the MTF charts. However, let’s not forget that these are emulated numbers based on the wide open performance. None of the MTF charts provide any information for the stopped down performance at apertures like f/5.6, where the performance truly matters. For this reason, it is impossible to say which lens is going to truly deliver, not until we get our hands on all three and do detailed evaluations in a lab environment with multiple samples. And that’s what I am personally looking forward to – as soon as all three become available, I am planning to test the lenses and provide early test data for the upcoming reviews. To see more details about the lens, check out the Tamron SP 24-70mm f/2.8 Di VC USD G2 page of our lens database. Really looking forward to your comparison between this the new Sigma and Nikon! Should be interesting to see how they all stack up. James, that would be an interesting comparison for sure! I found that the total of 17 elements in 12 groups and min focus distance in G2 version is same with previous version. Okura, it appears that Tamron is remaking the same lens with a different barrel, newer coatings and the ability to use the TAP-in console. Have you seen many focusing issues on this new G2 and how easy is it to figure out the TAP in console? If I had any need or use for this or the 70-200, I’d be all over them. I’m delighted with my 150-600 G2 and the console and I bet this is great too. I’m curious when Tamron will release the G2 of their lovely 15-30, but for now that lens is serving me just fine. Sean, the 15-30mm is already pretty amazing, but I agree – a G2 version of it that comes with all the latest and greatest technologies would be amazing. As an owner of the current Tamron 24-70 I am very disappointed. Optics looks the same, MTF identical. The main problem with the lens is the performance on [email protected] 2.8. The lens is very good on the wide end , yet portrait quality is simply not good. Second issue is the focus shift which creates a clear drop in performance when shooting at 5.6. If tests won’t prove different it is not the improvement I was waiting for. Yair, after looking at this new G2 version and its predecessor on Tamron’s website, you are right – the MTF charts indeed look identical. That’s a bit disappointing, considering that the older version suffered greatly at anything above 50mm. It looks like Tamron made a new shell, added weather sealing, coated the glass with all the latest coating technologies, improved AF speed and accuracy and reduced the price of the lens by $100. Still, I am looking forward to testing the new 24-70mm G2 – still hoping that Tamron added some silent optical updates that might make it better than its predecessor. Since I move to Nikon ( D810) due to the many advantages I am missing the Canon 24-70 2.8 which is great at both ends of the zoom. Shame that all companies publish only calculated MTF and not measured ones. Only Zeiss is different showing real measurement. The Tamron seems to me more a response to the Sigma ART than a real effort to improve. MTF is the same as G1 version! Tung, you are right, it turns out to be a re-release with some new updates – see my comment above. I now have three lenses that have been improved upon; considering my foray into full frame only started with the D810 release, just three years ago, I feel well left out and that Tamron should offer some form of upgrade program. With the 150-600 that update even included new specially designed teleconverters. Technology marches on, but the consumers of those technologies need consideration as well as these price points aren’t trivial. I don’t know what lenses you’re complaining about. The 150-600 G2 is significantly more expensive than the original, so complaining it’s better its silly – of course it’s better. The original Tamron 24-70 came out 5 years ago so it’s ready for an update, and you should have been able to get a nice discount if you bought it new. Remember, new stuff doesn’t hurt your old stuff. Are you going to be mad when Nikon brings out their D820 this year? Looking forward to your comparison Nasim! 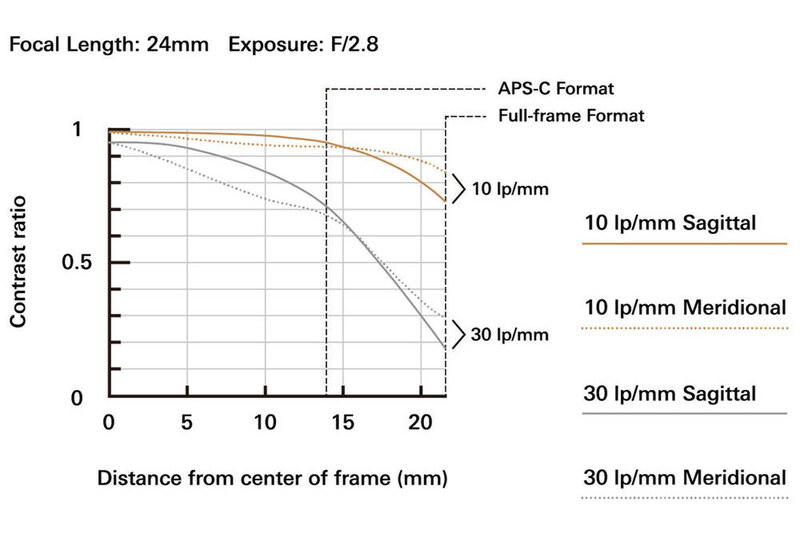 BTW I’ve always thought of 24-70mm f/2.8 as an event lens rather than purely architecture or landscape. Of course, ultimately it serves a wide variety of purposes. Judging by the MTF it looks like one still pays somewhat of a penalty outside of the center for not using primes, at least wide open, …. Question for everyone: have you noticed any “family” look among the Tamron lenses, vs Sigma, Nikon or Canon? I’m not referring to sharpness necessarily. Are there common characteristics within a brand to the rendering or bokeh, etc.? Art, it is a very versatile lens that can be used for all kinds of needs, including event photography. Personally, I prefer a prime + 70-200mm for portraiture – anything below 70mm is not going to make people look particularly good, especially at close distances. As for a particular “look”, aside from Zeiss and high-end Schneider glass that render very neutral colors, all Japan-made lenses for Nikon and Canon have a pretty similar look in terms of color. When it comes to bokeh though, that’s a different discussion, because it hugely depends on the optical design of the lens. Any time aspherical glass is used (and the Tamron 24-70mm f/2.8 G1 or G2 both have aspherical elements), expect to see onion-shaped bokeh. Nothing you can do about that, unless the aspherical glass is molded differently (such as in the case of the recent Sony portrait lenses). Hi Nasim, eagerly waiting for something good in this focal length at a good price. But one question is still in my mind will it be better than Nikon 24-70 2.8 VR (New one) in terms of sharpness and feel. Awaiting your reply. I have read that this lens is optically identical to the last version. If that’s true, according to the Camera Labs test on the last gen Tamron 24-70, it trailed both the Nikon and Sigma version. Can you verify that the 2 lenses are optically identical? Looking forward to your true tests compared to the New Sigma and Nikon. I have the previous version of this lens and was very happy with it’s sharpness but focus shift can be a problem after 50mm and the rubber on the barrel came loose, had it replaced recently. Now looking for a replacement and await your comparison of the new 24-70mm lenses of the Sigma, Tamron & Nikon. Would be a very interesting comparison to direct me in the right direction for my next purchase. As a dance photographer I’ve never really been able to consider 3rd party lenses as AF speed could never compete with Nikon’s own lenses. But I’m hoping this or the Sigma might be different as my version of the non-VR 24-70mm from Nikon has always left me dissatisfied. Do I have any reason to think they might compete or is it just not going to happen? It will be interesting to see if they have addressed the weak points of the original lens, such as the distracting bokeh. I am looking forward to your review also, along with a review against Nikon and Sigma offerings. I think it is the same “trick” they did with the latest version of their 90mm macro lens. Same lens, just a bit nicer outside and compatible with the tap console. If you have the current version probably no need to upgrade. I look forward to the test results of the new Sigma (the price of the new Nikon is just too ridiculous overpriced). Hi there! I currently have the old 24-70mm sigma and I am not very happy with the performance (e.g., autofocus, sharpness). I am looking to purchase a new 24-70mm lens and I was wondering if you could compare all existing 24-70mm lenses once this one is released? I am specifically interested in Nikon vs. Sigma Art vs. Tamron. Nasim, I am soooo looking forward to your review of this lens whenever you get your hands on one, it would be my final push, as I did own the previous one, but was fortunate enough to have the Nikon 24-70 non VR and the Tammy at the same time, AND only kept the Nikon as it was stronger at the 70mm end, I think that may not be an issue this time around, also my hands are not as steady, and my kids move faster, so 5 stops will be a god send!!!! PS hurry and get one!!! these lenses have been available for quite a while now, are we going to see a review anytime soon? Same question regarding the tamron 70-200 g2. I would like to see comparisons against their counterparts. All lenses used on the same camera so we can actually see the real difference. you guys use too many different cameras which makes it impossible to take results seriously unless compared in the same review using the same camera. Hey Nasim, I’m sure I speak for many when I write that we’d greatly appreciate your full review on this lens; I’ve come to rely on your guidance before making new purchases, and I always buy through your affiliate links. Thank you in advance for your time!